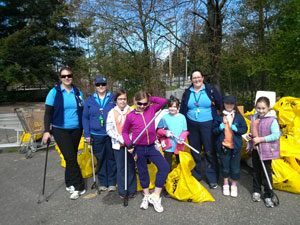 Three Leaders and four girls from the 3rd Ottergrove Brownies and one girl from the 11th Ottergrove Guides let the community “Hear Our Voice” and see us in action as we volunteered for the Aldergrove Community Clean-up on April 21st. The group scoured the streets for 3 hours and managed to haul in 5 bags of garbage including 6 socks (none of which matched) and a skillet! Way to go girls!